When: Fri., April 26, 6-9 p.m. In celebration and participation in the first annual Salt and Fog Fish Festival, we are happy as clams be a destination on the map for the Fish Out of Water Pub Crawl. This pub crawl is kicking things off for a weekend full of fun. See the festival website for details. https://www.visiteureka.com/salt-and-fog Stop in at the Tap Room to enjoy event themed ciders and live music! 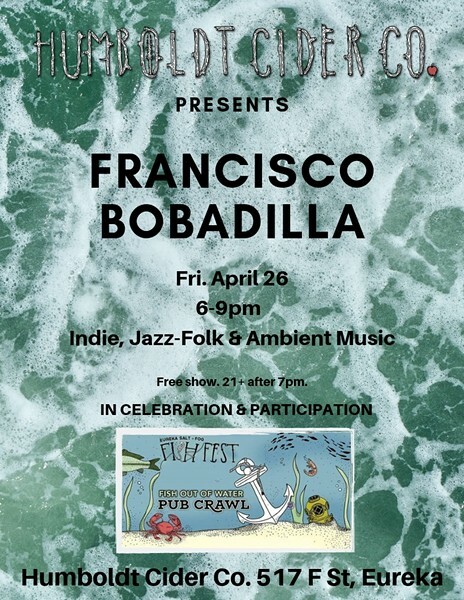 Music Feature: Francisco Bobadilla. His music range includes acoustic indie, jazz-folk, ambient guitar looping, keys and bass. Free. 21+ after 7pm.